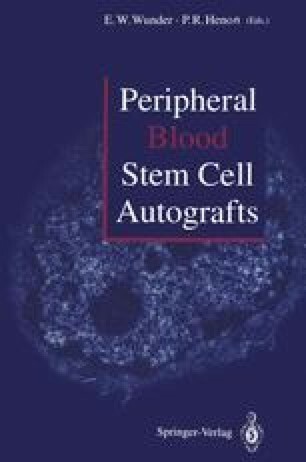 Autologous blood stem cells collected during the recovery phase after intensive chemotherapy are rich in progenitor cells, and, when infused into patients who have received myeloablative therapy, lead to rapid and durable hematopoietic reconstitution . The rate of engraftment has been demonstrated to be correlated with the number of late progenitor cells infused . This work was supported in part by a grant from the Foundation de France and the Federation Nationale des Centres de Lutte contre le Cancer (FCLC).